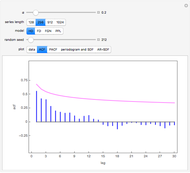 Power-law decay time series are characterized by autocorrelation functions that decay as , where is the lag and is the decay parameter. When , the time series exhibits strong persistence, with smaller values of indicating stronger persistence. When , the time series exhibits high-frequency (or alternating) behavior and is said to be anti-persistent. Such time series are also characterized by a spectral density function that is proportional to , where is the radial frequency. 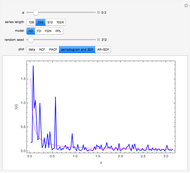 This Demonstration investigates four basic types of power-law decay time series—HD (hyperbolic decay model), FD (fractionally differenced white noise), FGN (fractional Gaussian noise), and PPL (pure power-law process)—by simulating a series of length and displaying one of five selected graphs: the time series plot (data), the autocorrelation function (ACF), the partial autocorrelation (PACF), the periodogram, and the spectral density function (SDF). In each case, blue represents the data or sample estimate and magenta represents the expected value. 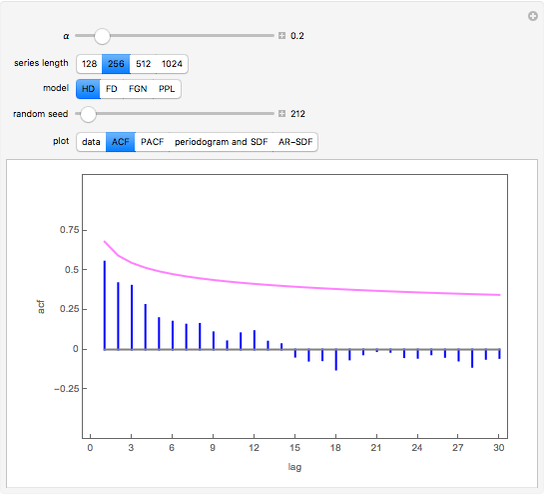 Snapshot 1: This shows the autocorrelation for FGN with and series length . The setting corresponds to a Hurst coefficient of 0.9, which indicates very strong persistence. We see there is a large bias in the usual sample autocorrelation, since the true value is always much larger, except at lag 1. 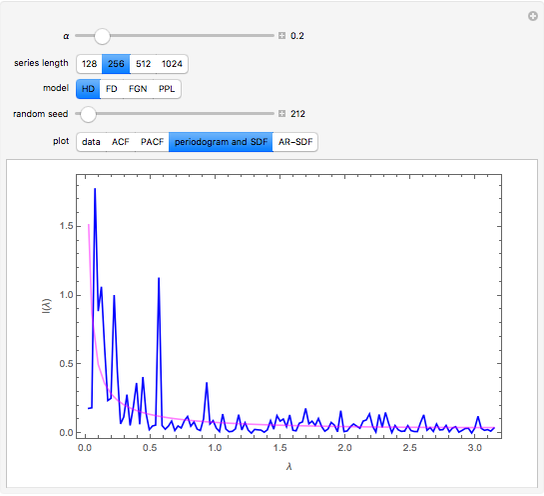 Snapshot 2: This shows the partial autocorrelation for the same data used in snapshot 1. The partial autocorrelation was estimated using the Burg algorithm, and it seems to do a better job. 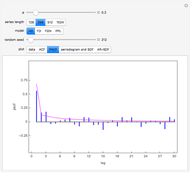 Snapshot 3: The periodogram and its expected value, the SDF, are shown. Snapshot 4: The SDF is shown in magenta along with its estimate in blue. The SDF is estimated by fitting an AR model using the Burg algorithm with model order determined using the AIC criterion. 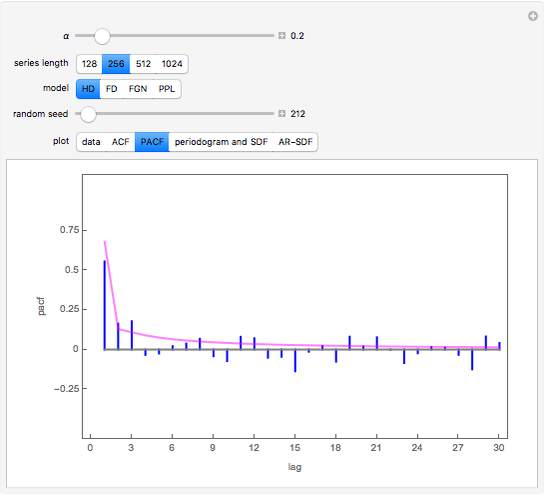 For an overview and further references for the time series models, see . J. Q. Veenstra and A. I. McLeod, "A New Hyperbolic Decay Time Series Model," 2012. Submitted for publication. Justin Veenstra and Ian McLeod "Time Series for Power-Law Decay"